Over the last decade Bed-Stuy has come a long way, moving far, far away from its “Do or Die” motto transforming into a noted city destination. The transformation is in part due to New York’s overall changing dynamics, but it’s the local residents’ ongoing commitment to improving and preserving the area, even in the face of government neglect, that has really been the backbone of its survival. 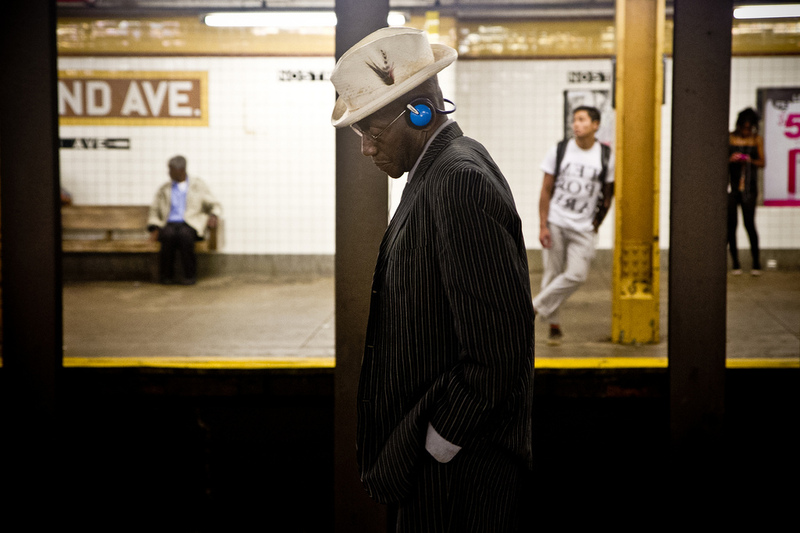 Today’s Bed-Stuy is increasingly economically and ethnically diverse. 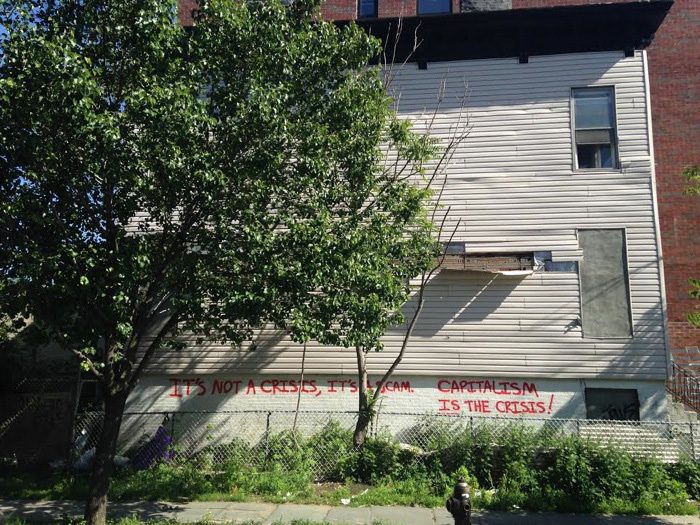 In this piece we touch on the neighborhood’s major changes as well as what’s predicted for this incredible and storied area of Brooklyn. 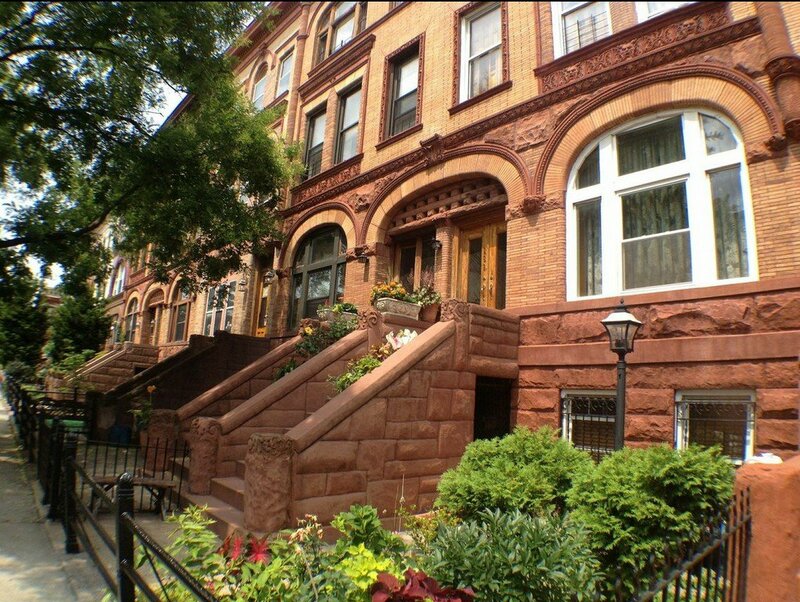 In the early 1900s, prosperous black families began buying up the mansions of Bed-Stuy, many of which were designed by prominent architects. The population was quick to grow, but it wasn’t until the 1930s that Bed-Stuy’s black population boomed. African-Americans left crowded Harlem in search of better housing opportunities and where to settle was very much due to the introduction of the IND Fulton Street Line (a.k.a. the A/C line) in 1936. The line opened to Rockaway Avenue and the A train provided a direct connection to Harlem, the city’s largest African-American community. Bed-Stuy quickly became the second destination for black New Yorkers and the New York Times even dubbed it “Little Harlem” in 1961. A huge influx of West Indian and Caribbean immigrants came during the 1960s and 70s, and the community continued to grow into the 80s with the Hip-Hop Generation. Jewish families also made up a large part of the neighborhood but their population saw a decline as the African-American population grew. The drop was greatest in the 60s due to property crime, racial tension, and according to Brooklyn Ink,”unscrupulous real-estate agents who exploited the racial transformation of the area to provoke panic-selling by white homeowners.” The shifty move was detrimental to the area as a whole. The decommissioning of the Brooklyn Navy Yard and the curtailing of the elevated railway also hurt the area. 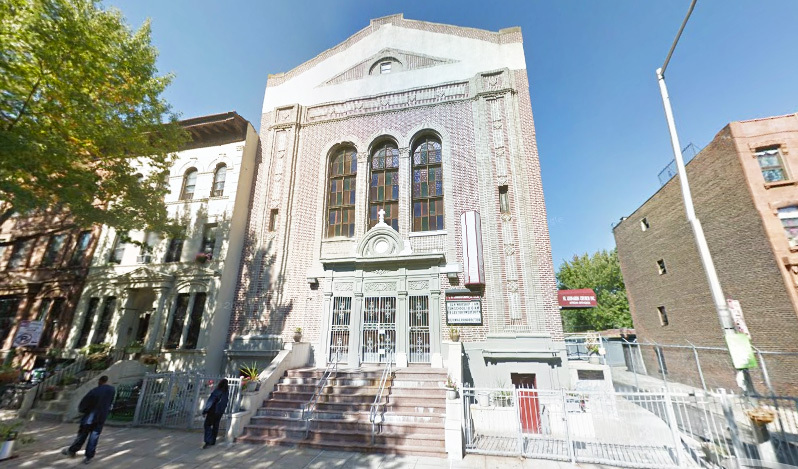 Many of the area’s synagogues became African-American churches and today still have Jewish symbols, as seen with St. Leonard’s Church, located at 765 Putnam Avenue between Malcolm X Boulevard and Stuyvesant Avenue. The proportion of African Muslims in the area has also increased as well. Though not quite the birthplace of hip-hop, the role Bed-Stuy in the music movement was central. 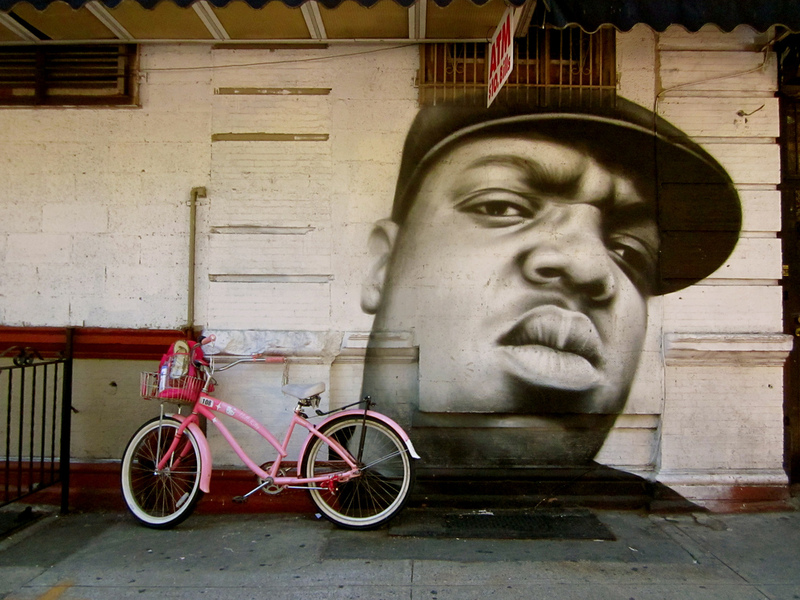 Hip-hop’s roots in Harlem spread throughout New York and deep into Bed-Stuy. Some of the movement’s greatest called the neighborhood home and included Jay-Z, Mos Def, Big Daddy Kane, and of course, Biggie Smalls. Their music provided commentary on both the tragic history of blacks in America but of the continued suffering experienced in Bed-Stuy as a result of crime rates, poverty, neglect and especially drugs. In Mos Def’s song “Mathematics”, the artists raps “I’m blacker than midnight on Broadway and Myrtle” which spoke to the area’s skewed demographics. Many songs also incorporated the neighborhood’s unofficial motto, like Kane’s “How You Get a Record Deal” with the lyrics “It’s sort of a tradition in Bed-Stuy to do or die / So steppin’ to me is suicide”. Myrtle Avenue was even given the moniker “Murder Avenue” in a number of songs. And Jay-Z’s “Brooklyn We Go Hard” and Talib Kweli’s “Get By” also brought to light the critical state of the neighborhood in the 80s through the early 2000s. However, Bed-Stuy’s influence on music wasn’t limited to hip-hop. There’s even a Billy Joel song, “You May Be Right”, that references the high crime rates of the 80s: “I was stranded in the combat zone / I walked through Bedford-Stuy alone.” The music that came out of the neighborhood coupled with the Do or Die state only made the area more mysterious and intriguing to outsiders, particularly white people. This crowd-sourced map offers up a more comprehensive view into the neighborhood’s contribution to 1980s hip-hop. But for folks who weren’t into the music of the time, their intro to the neighborhood probably came via Spike Lee’s 1989 racially-charged comedy-drama Do the Right Thing. Though arguably not as prolific, other notables who have lived or currently live here include Lil’ Kim, M.I.A., Chris Rock, Tracy Morgan, Mike Tyson, Jackie Gleason, Lena Horne, Norah Jones, and the late singer Aaliyah. Uma Thurman’s brother tried buying a home there earlier this year but was outbid several times. Lenny Kravitz spent his childhood in a small wood-framed home at 368 Throop Avenue, which to neighbors’ dismay will soon be renovated into a six-family apartment building. For roughly the last seven years, Bed-Stuy has been a quiet pole for creatives looking to settle in, but rather than pulling in 9-5 white collar workers, the neighborhood has on the whole attracted a more a forward-thinking, creative bunch that ranges from photographers and architects, to graphic and fashion designers, to students and artists looking for live/work buildings with commercial space at the ground floor. Ban Leow of Halstead, who has been working and living in the neighborhood for the last decade, tells us that the biggest spike in interest occurred four years ago when people began to take note of the stunning, well-preserved, affordable homes with lots of space to stretch out. But increased policing and grassroots movements to clean up the area have also helped the neighborhood recover tremendously. In 2005 a campaign was launched to supplant the “Bed-Stuy, Do-or-Die” slogan with “Bed-Stuy, and Proud of It”. Leow himself is championing for “Rent or Buy”. Orthodox Jews have also returned to the area. 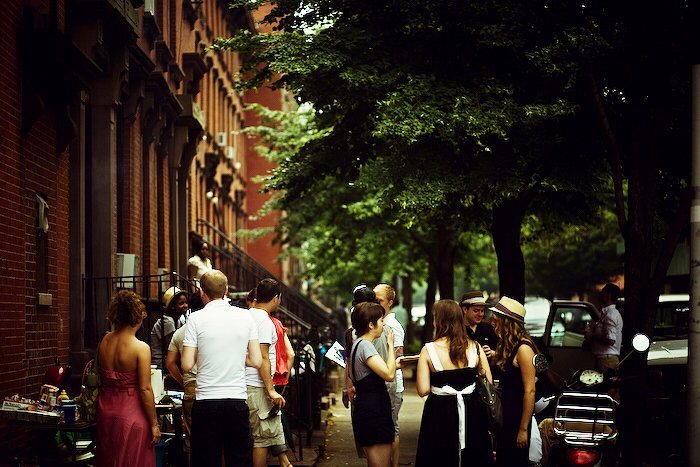 In part due to overpopulation in the surrounding areas, such as South Williamsburg, Clinton Hill, and Crown Heights. By sheer proximity, the extension is completely organic. 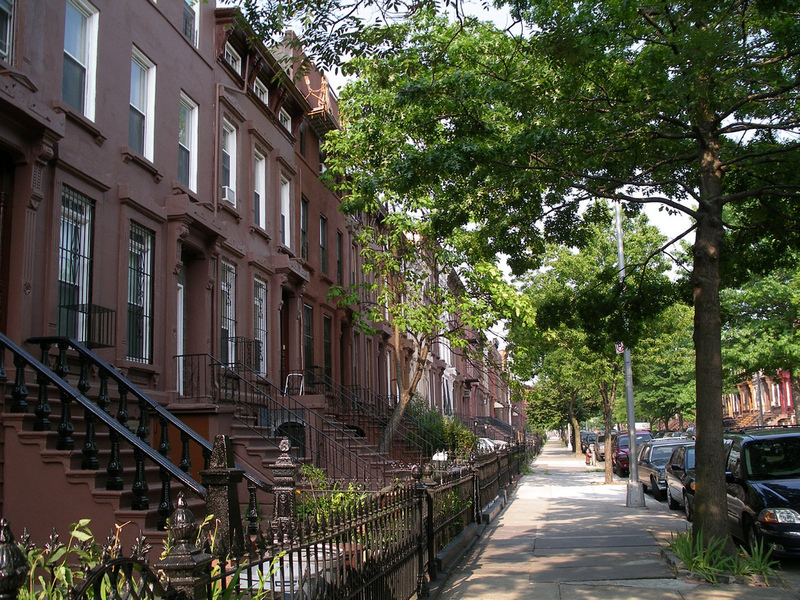 Like most of Brooklyn, Bed-Stuy has seen a major uptick in real estate interest. One building to recently hit the market is the neighborhood’s tallest building at 11 Spencer Court. The owners of the 13-story, 23-apartment rental are hoping to sell the building for $13 million—that’s 50% more than what they paid for it two years ago. Is the price warranted? Right now the average studio is going for $1,530/month; one-bedrooms $1,837/month; and two-bedrooms for $2,227/month (source: MNS). For buyers, buildings like Thornton Park and 156 Pulaski Street, are asking for $600K+ for two-bedroom pads, there’s even a condo at the Verve at 170 Putnam Avenue asking for $1.1 million. Although, why anyone would choose a tiny apartment over one of the neighborhood’s gorgeous brownstones or townhouses is beyond us. The neighborhood boasts several of the city’s best preserved late-19th-century streetscapes with homes in the Italianate, Queen Anne, Romanesque Revival, and Renaissance Revival styles. Currently, the landmarks commission is trying to designate a 16-block area bounded by Gates Avenue, Fulton Street, Bedford Avenue and Tompkins Avenue as the Bedford Historic District. There is already a Stuyvesant Heights Historic District bordering, and this area was recently extended. Back in 2011, Ban Leow sold a two-family brownstone on Decatur Street at Lewis Street for $1.7 million, but Leow says today there is a similar property on the same street currently going for close to $2 million. Leow also holds the listing for the historic John C. Kelley Mansion up for grabs at $6 million. The storied 1900 home on Hancock Street was the former hangout of President Grover Cleveland, and it’s the priciest single-family home in Bed-Stuy. And we recently wrote about this lovely two-family reno going for $1.425 million. Increased interest in the neighborhood has also pulled in plenty of people ready and willing to set up shop in the area. The introduction of Saraghina eight years ago probably had the greatest impact on the neighborhood and their success showed the rest of the city that Bed-Stuy had the potential of becoming a destination for fine dining, cool wares, bakeries and coffee. The Zagat-rated pizza restaurant’s foresight really paved the way for many of the hip eateries and outposts popping up today. In fact, the neighborhood just opened up a new coffee/fashion concept store, Sincerely, Tommy, and there are a number of other top shops in the pipeline. A business improvement district has been launched along the Fulton and Nostrand Corridor with plans to bring new street trees, street furniture and signage in an effort to attract more business investment. Residents and real estate insiders say that Malcom X Boulevard is primed to be the Smith Street of Bed-Stuy. And though that may make you cringe, many will agree that new local businesses are good for the overall economic development, safety and convenience of the neighborhood. Bedford Hill on Franklin Avenue. This spot also serves food and alcohol. David’s Brisket House on Nostrand. A longstanding classic where locals swear by the pastrami sandwich. “Best pastrami sandwich in the city,” we’ve been told. Jazz and Blues lounge Silver Lining, formerly in Tribeca, is on its way. An off-shoot of Soho’s Le Philosophe is in the works.